Bloggers gathered at The Den first for the mini presscon. I have never seen so many lifestyle bloggers in one place! :) After an hour, the 4 Asian chefs (the best from Thailand, Indonesia, Malaysia & Vietnam), which they flew in, were introduced. And then chaos ensued. Heh. JW Marriott Bangkok's Thanatorn Krobsuay and his famous papaya salad. JW Marriott Jakarta’s Dadang Wahyudi and his famous skewers or satays. Renaissance Kuala Lumpur’s Ruhizad Muri and his specialty dish, beef rendang. Renaissance Riverside Saigon's Phan Tien Hoa and his specialty, vietnamese spring rolls! For the mandatory ice breaker (hehe) they conducted a mini game! Since fashion bloggers are competitive in nature (haha) we all volunteered and participated. Shempre pasimuno na naman ako. Haha! We all joined thinking it will just be a simple connect the dots (connect the chef with his dishes) kind of game but we were wroooong. It was a buwis buhay memory game (what's with the buwis buhay games lately? tsk haha). Lol. 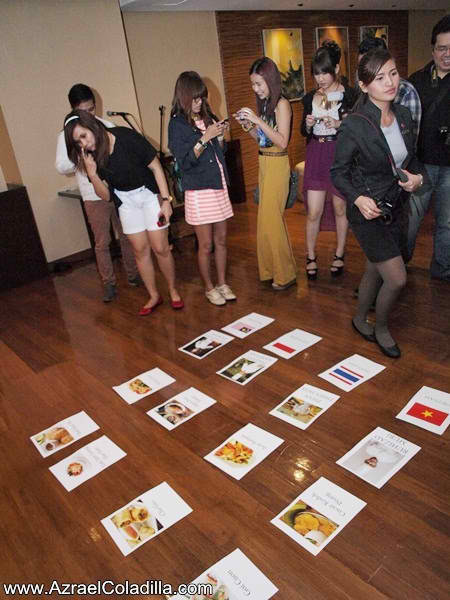 ...which we gave to our non-fashion blogger member (far right--he did all the identification). Thank you! Japanese -- sashimi, MIso soup, tempuras. Ate tempura,miso and california maki--it's delish! I suddenly remembered my Vietnam trip. Haaay. Love the soup and the "okoy"! Ana and I had one made especially by the chef himself! Satay! They have a tasty selection of chicken, shrimps, calamari, beef, goat, pork and fish in assorted marinations. I was drawn to this station because it's the only station (aside from Thailand) that serves rice! Hehe. Saw my favorite Nasi Lemak (yum). Also got pork siopao (forgot what it's called but I loved it!). Thank you Thai station for the rice! Hehe. Love the bagoong rice. Woot. Loved the Chicken with Coco Milk (Malaysia)! It was fun sharing this amazing Asian "food tour" with these peeps! Thanks again Marriott Hotel for this amazing experience. Thank you Anton for inviting us! 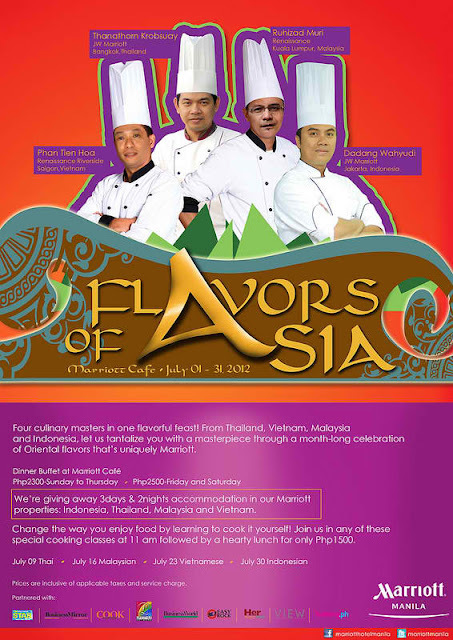 Enjoy Flavors of Asia in Marriott Hotel Manila, Newport City Complex, Pasay City. For only P2, 300 net from Sunday to Thursday and P2, 500 net for Friday and Saturday.